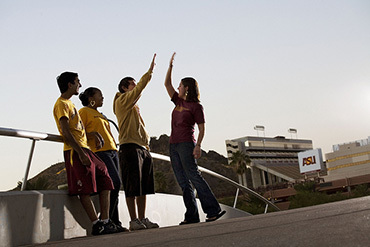 American Indian Studies at Arizona State University is an academic program offering both undergraduate (BS) and graduate (MS) degrees. Our program emphasizes the latest ideas and research impacting Indigenous communities across the US, including Alaska and Hawaii. Our faculty and affiliate faculty have distinguished themselves by creating a body of scholarship and original research, which is influencing the field today. Serving Indigenous nations since 2002, the AIS program at ASU is setting the agenda for the 21st century! The American Indian studies internship affords students the opportunity to relate their learning to the professional environment, through a structured practical experience.